2017 Shipping Showdown – Royal Mail vs Couriers! Any long time readers of my blog or anyone who has purchased either of my courses – Easy Auction Business or eCommerce Magnates – knows just how much of an emphasis I place on shipping. And for a good reason – shipping is one of the most important factors when it comes to making money online! It’s really the main obstacle we have to face vs traditional brick and mortar stores where the customer actually leaves with the product in their hand. Why do you think eBay and Amazon place such a huge emphasis on shipping? Don’t believe me? Let’s just take a quick look at some of the evidence then, starting with eBay, who basically completely reworked their entire defects system – putting a large emphasis on delivery time using their late delivery metric. And they’re not stopping there! Amazon are actually developing drones for their future delivery service called Prime Air. Exciting stuff, but what’s the relevance to us? What does this mean to me and you? Well really I’m trying to show you how important it is to get your shipping right – and that means using the best method available, in terms of price and delivery time. And today we’re having a rematch! As always there has been a number of price changes, size adjustments, new couriers and shipping services introduced, etc. etc. Basically – it’s time to see what the best options are for us at the moment, for 2016 and 2017. Now in the previous showdown the two main companies we compared were MyHermes and Royal Mail and they’ve both made some changes in recent years to their pricing and also parcel size brackets – with Hermes introducing dimension limits as well as weight. This is for their standard, non-tracked delivery service. Previously one of the best things about MyHermes was that they didn’t have size requirements for each price bracket, it was just done by weight… however that has come to an end as in August of this year they introduced size limits as well! This was done to make their service more comparable to Royal Mail, as the “Small” parcel size has the exact same limits as it does with RM. But enough of that, you want to know how these prices translate to real life items, right? 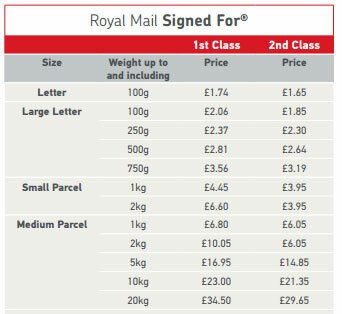 Well as you can see from taking a quick look at the table Royal Mail is nearly always the best option for lightweight and small items, particularly if they can be sent as a letter or even large letter. However when the items start to get bigger, Royal Mail starts to get comparatively more expensive! In such cases it’s nearly always much cheaper to use a courier. But let’s still quickly run through our shipping showdown and see if there are any changes from last time! This will be sent in a jiffy bag with dimensions of 245mm by 175mm and will weigh between 150-200g when packaged. 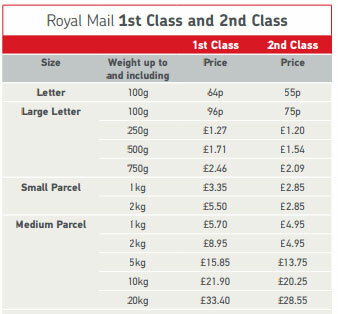 Posting via Royal Mail will cost £1.27 (1st Class, NOT signed-for) and posting via a courier would cost £2.75 if dropped off or £3.10 if collected. So that makes the post office less than half the price of the courier and as expected, it’s an easy win for RM for this small item. This will be sent in a mailing bag with dimensions of 40cm x 30cm x 3cm and with a packaged weight of 700g. Posting via courier will cost £2.92 using MyHermes, but if you wanted a one day delivery service it would cost you £6.95 using DPD. So overall I have to give this one to Royal Mail as it’s much cheaper for a faster delivery time, but this was a close round. This is when we expect RM to start struggling a bit, as we move on to a much heavier item, with a weight of 1.5kg and packaged dimensions of 25cm x 25cm x 25cm. Now with an 8% difference in cost, this one is really too close for me to call a clear winner! So far Royal Mail has been doing very, very well in this shipping showdown. This is mainly because of the price DECREASE (yes, you read that right!) that they introduced on the Small Parcel up to 2kg size, which costs a highly competitive £2.80. They actually introduced this as a promotion a few years ago but have kept the price ever since! Not that I’m complaining as this has been a godsend for many of my blog readers and customers! For round 4 we’ve got a statue seller, who is posting an item weighing 8kg with packaged dimensions of 40cm x 40cm x 30cm. To post this item via your local post office would cost £16.40 using Parcelforce (the regular postage options are more expensive and offer less cover for loss or damage). 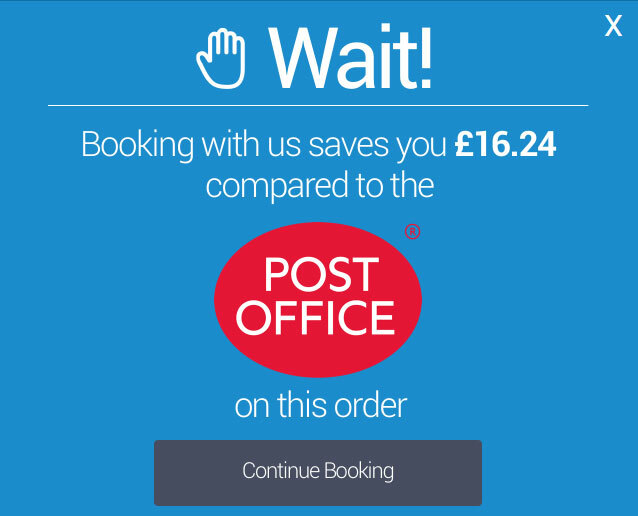 Using a courier would cost £7.14, with DPD being the cheapest option (booked via ParcelMonkey – which is the site I recommend for larger items as they offer the best quotes). So that’s a clear win for the couriers, coming in more than 50% cheaper than Royal Mail. For our 5th and final item we have a chess set weighing 15kg with packaged dimensions of 60cm x 50cm x 50cm. This item can’t even be sent using Royal Mail’s normal 1st and 2nd Class services, and the cheapest Parcelforce service is £23.14 for delivery within 2 working days. However if you booked this same Parcelforce service via ParcelMonkey, it would cost £11.94 and would be collected from you! And using DX and their next day delivery service would cost £7.91, so a huge win for the couriers. It was of course obvious that a courier would be significantly cheaper for such a heavy and large item, but I just wanted to illustrate my point that in general: smaller and lighter > Royal Mail & larger and heavier > Courier. Thankfully Royal Mail’s “promotion” on the up to 2kg Small Parcel has made them a viable option for medium sized packages as well, and I hope they don’t bump the price back up any time soon. But I have to say that Royal Mail have been fairly good with their price increases in recent years. So in 3 years price increases of around 24-47%! Good news for us online sellers! Of course when your business grows and you’re starting to sell in decent volume, you will get business pricing anyway – whether that’s with Royal Mail or a courier. Today’s post and quick shipping showdown is for those just starting out on eBay who need a guide on which option to use for various different products, and I hope you’ve found it useful! My company is having only EU shippments and after some trial-error phase, our go-to service is Ecoparcel to send a parcel: https://www.ecoparcel.eu/ . As small company we appreciate every little sum we can save – so cashback program is a charm for us! What are your thoughts on the 2D labels that Royal Mail have started to feed out to certain users (I know they’re on most online bought labels e.g click and drop, DMO etc but only some users have their 2D labels scanned at delivery). They scan the 2D label which shows proof of delivery, no tracking along the way i believe. Ebay also accept this as proof of delivery in item not received cases(this is coming from ebay forum as I have no experience myself as I’m not one of their beta testing customers who this applies to yet). Will this take away a need for the “signed for” service? Do you think that they will be increasing their prices once this service is rolled out to all users? If not I’m certainly considering on switching over to Royal Mail for many of my parcels. Currently use Hermes for most as my parcels are under 2kg, small at 2.75 a parcel. I would pay the 2.80 Royal Mail second class for the faster delivery time. Only really use Royal Mail for LL, when someone upgrades to standard delivery (first class) or for international orders. Also I know that some courier companies have created delivery drones e.g DPD but they need to wait for legislation to be in place for them to be used. Are any other couriers/Royal Mail preparing for this? As surely this is going to be the standard delivery in a few years. Many thanks for your always interesting blog post. No, I don’t have any experience with the new 2D labels but it’s definitely the future of how RM will handle shipments. As far as I understand, Signed For service will still be an option as when you deal with credit card processors, they need signature as proof of delivery (when dealing with charge back cases etc.). I really hope they won’t raise the prices for standard delivery with 2D barcode but most likely they will do. Time will tell. Drones are in works for many companies but as you mention correctly, they wait for legislation to be in place plus probably need to polish technology a bit more too. Tests are tests but to roll it out in real life is a whole another story. Knowing Amazon, their on-going innovation, they will probably be first in the UK to offer this service. I have been a RM account holder, and now DMO user. As I understand it, they have been scanning the 2D barcodes for a while, however only just started enabling accounts to be able to access those scanned details. I have had mine switched on in the past week, and I can say it’s definitely a good thing. There are lots of anomalies at the moment, meaning not every item is scanned (maybe they have trouble reading it, maybe the postie is not doing it correctly). – When a customer says they haven’t got their parcel, the info tells you that it’s been delivered to a neighbour or the sorting office. You can advise them of this, where as previously you wouldn’t know. (The amount of items without cards being put through the letter box, or maybe misplaced is unbelievable!). I don’t really believe RM will increase prices on this basic service, as they will still charge for full tracking and signed for. It’s just a way of gaining loss ground on the cheap couriers like Hermes. As an aside, for Tom, RM accounts don’t really need to see a big volume, I think you can get an account for as a little as 1000 items per year. Thanks for your comment Paul, I agree 100% on what you say! Andrew, your study dos’nt take into consideration “excluded” items, ie those NOT covered for loss or damage. For example the statue that you use for an example would not be covered by Hermes as it is presumably made from …………. “Ceramic or composite items of any description including without limitation glass, mirrored items, crystal, ceramics, porcelain, plaster, marble, china, stone, slate, resin, granite, concrete (or any item containing these materials)”. Many Thanks for pointing this out Philip, that’s a good point! I should probably look into this in more detail and do another article on this topic. In UK royal mail is best however Internationally what i have understood through my experience is that they hand over the post to the relevant country’s public postal company and after that it is at their mercy as to when they ship it ! Some services are really impressive however many are slow for instance Australian post is Brilliant .However Portuguese,Russian Spanish, Italian, US, Mexican and Canadian posts for example are slow .Portugese and Russian posts was so irritating for us that we had to add these countries to exclusion list of our items . And this is exactly why I don’t post Worldwide, only Europe. If large part of your sales is to countries outside Europe, you’ll simply have to deal with these issues all the time as there are no alternatives to RM in terms of prices for such small, international shipments. I want to show you a seller ( Brand) who claim unbelievable speed of delivery in Europe (5-7 days in EU countries and feedback is 99.8% which is amazing) I am not sure if they will disclose their “secret ” if asked Any anyway here is the link. There are no alternatives to ROM when it comes to such small/cheap items, there are simple NONE! As for that listing – they clearly state that they use RM for EU deliveries. 5-7 days is a typical delivery time for EU deliveries, in most cases it’s just 4-5 working days so I can’t see any special about that.